Dinah Shore (born Frances Rose Shore; February 29, 1916 – February 24, 1994) was an American singer, actress, and television personality. She was most popular during the Big Band era of the 1940s and 1950s. After failing singing auditions for the bands of Benny Goodman and both Jimmy Dorsey and his brother Tommy Dorsey, Shore struck out on her own to become the first singer of her era to achieve huge solo success. She enjoyed a long string of over 80 charted popular hits, lasting from 1940 into the late '50s, and after appearing in a handful of films went on to a four-decade career in American television, starring in her own music and variety shows in the '50s and '60s and hosting two talk shows in the '70s. TV Guide magazine ranked her at #16 on their list of the top fifty television stars of all time. Stylistically, Dinah Shore was often compared to two popular singers who followed her in the mid-to-late '40s and early '50s, Doris Day and Patti Page. 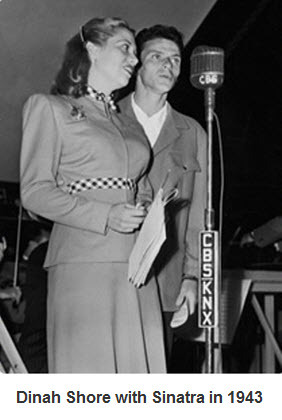 In March 1939, Dinah debuted on national radio on the Sunday afternoon CBS radio program, Ben Bernie's Orchestra. In February 1940, Dinah Shore became a featured vocalist on the NBC Radio program The Chamber Music Society of Lower Basin Street, a showcase for traditional Dixieland and Blues songs. With Shore, the program became so popular that it was moved from 4:30 Sunday afternoon to a 9:00 Monday night time slot in September. In her prime-time debut for "the music of the Three Bs, Barrelhouse, Boogie-woogie and the Blues", she was introduced as "Mademoiselle Dinah 'Diva' Shore, who starts a fire by rubbing two notes together!". She recorded with the two Basin Street bands for RCA Victor; one of her records was the eponymous "Dinah's Blues." Shore's singing came to the attention of Eddie Cantor, and he signed her as a regular on his popular radio show, Time to Smile, in 1940. Shore credits him for teaching her self-confidence, comedic timing, and the ways of connecting with an audience. Eddie Cantor bought the rights to an adapted Russian folk song with new lyrics by Jack Lawrence for Dinah Shore to record for RCA Victor's Bluebird label. This song, "Yes, My Darling Daughter," became her first major hit, selling 500,000 copies in a matter of weeks, which was unusual for that time. Shore soon became a successful singing star with her own radio show in 1943, Call to Music. Also in 1943, she appeared in her first movie, Thank Your Lucky Stars. The movie starred Eddie Cantor, and she soon went to another radio show, Paul Whiteman Presents. During this time, the United States was involved in World War II and Shore became a favorite with the troops. She had major record hits, including Blues In the Night, Jim, You'd Be So Nice To Come Home To and I'll Walk Alone, the first of her number-one hits. To support the troops overseas, who liked her singing, she participated in USO tours to Europe. She met George Montgomery, a young actor ready to go into military service. They married on December 3, 1943, shortly before he went into service. When he returned, they settled in San Fernando, California. In 1948, their first child was born, a daughter named Melissa Ann, and they also adopted a son in 1954 named John David before moving to Beverly Hills. Shore continued appearing in radio shows throughout the 1940s, including Birds Eye-Open House and Ford Radio Show. In early 1946, she moved to another label, Columbia Records. At Columbia, Dinah Shore enjoyed the greatest commercial success of her recording career, starting with her first Columbia single release Shoo Fly Pie And Apple Pan Dowdy and peaking with the most popular song of 1948, Buttons and Bows, which was number one for ten weeks. Other number one hits at Columbia included The Gypsy and The Anniversary Song. One of her most popular recordings was the holiday perennial Baby, It's Cold Outside with Buddy Clark from 1949. The song was covered by many other artists, Ella Fitzgerald, for example. Other hits during her four years at Columbia included Laughing on the Outside (Crying on the Inside), I Wish I Didn't Love You So, I Love You (For Sentimental Reasons), Doin' What Comes Naturally, and Dear Hearts And Gentle People. She was a regular with Jack Smith on his quarter-hour radio show on CBS. Shore acted in films such as Follow the Boys and Up in Arms (both in 1944), Belle of the Yukon (1945), and Till the Clouds Roll By (1946). She lent her musical voice to two Disney films: Make Mine Music (1946) and Fun and Fancy Free (1947). Her last starring film role was for Paramount Pictures in Aaron Slick from Punkin Crick (1952), co-starring Alan Young and Metropolitan Opera star Robert Merrill. In 1950 Dinah went back to RCA with a reported deal to record 100 sides for $1,000,000. The hits kept coming, but with less frequency, and weren't charting as high as in the '40s. Dinah's biggest hits of this era were My Heart Cries for You and Sweet Violets, both peaking at number three in 1951. Several duets with Tony Martin did well with A Penny A Kiss being the most popular, reaching number eight on the charts. Blue Canary was a 1953 hit and Dinah's covers of Changing Partners and If I Give My Heart To You were popular top twenty hits. Love and Marriage and Whatever Lola Wants were top twenty hits from 1955. Chantez, Chantez was Dinah's last top twenty hit, staying on the charts for over twenty weeks in 1957. Dinah stayed with RCA until 1959, and during that time released several albums including Bouquet of Blues, Once in a While, and Vivacious, which were collections of singles with different orchestras and conductors such as Frank DeVol and Hugo Winterhalter. Moments Like These, a studio album from 1958, recorded in stereo, with orchestra solely under the musical direction of Harry Zimmerman, who performed the same duties on The Dinah Shore Chevy Show, being the exception. People did not appreciat e the great"WILLIAM and MARY writing and performances originally. I would like all 22 episodes. Guess they are lost forever.